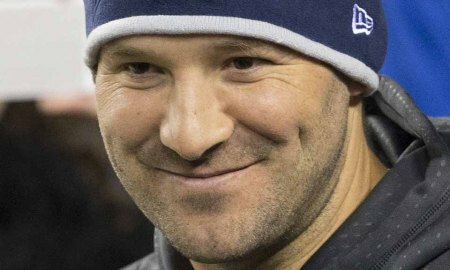 Antonio Ramiro Romo, better known as Tony Romo, is a former American football quarterback, born April 21, 1980, in San Diego, California, to Ramiro Romo Jr and Joan (Jakubowski) Romo. His father is Mexican-American and his mother is of Polish-German descent. Tony spent his entire career with the Dallas Cowboys. He was signed by the Cowboys as an undrafted free agent in 2003. He played College Football at Eastern Illinois. In 2011, Romo married beauty queen Candice Crawford. They have two children: Hawkins and Rivers. *He was signed by the Cowboys as an undrafted free agent in 2003. *He won the Walter Payton Award as the best player in Div I-AA while starring for the Eastern Illinois Panthers. *He had a much publicized relationship with singer Jessica Simpson from 2007 to 2009. *He announced his retirement from the NFL on April 4, 2017.